He's fighting appointees who would put polluters interests above our own. 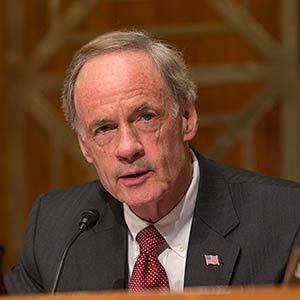 President Trump has been struggling to get his dangerous environmental nominations approved — because Delaware's own Sen. Tom Carper is standing in his way. He has been fighting to protect Americans from appointees who would put polluters interests above our own, and because of his efforts two of Trump's most threatening environmental nominations have been withdrawn. We need champions like Sen. Carper to keep standing strong against the Trump Administration’s attacks on the environment. To make sure that happens, he needs to hear from you right away. Take action today, and send Sen. Carper a thank you note — and ask him to keep up the good work! I'm writing today with great appreciation for your hard work standing up to President Trump and putting Delaware First. By leading the fight against Trump's dangerous, anti-environment nominations of Michael Dourson and Kathleen Hartnett White, you have ensured cleaner air, cleaner water, and a safer environment for our families. Thank you for your leadership in protecting the health of the people of Delaware. Please keep up the good work, and continue to fight the Trump Administration's attacks on our bedrock environmental protections.